Cambridge University has a residential adult education centre in the delightful Madingley Hall. Some time ago I ran a weekend course there on ‘The Life and Work of Abraham Maslow’, and among the end-of-course essays I was surprised to find that two students reproduced the Hierarchy of Needs with only five levels – physiological, safety, belonging, esteem, and self-actualisation. This was in spite of the fact that I had spent one and a half hours on the sixth level – intrinsic values – which Maslow added to his list of motivational needs shortly before his death. It seemed that these students had previously been taught that there are five basic motivations, with self-actualisation at the top, and as far as they were concerned nothing I had said would change that. What was going on? How had this dichotomy between two different branches of psychology come about? The answer is historical. Abraham Maslow (1908–1970), some-time President of the American Psychological Association, is best known for his work on human motivation and in particular for his Hierarchy of Needs, which was first defined in a paper of 1943. This 1943 paper subsequently became a standard feature in the practical application of motivation theory in business and management, and it has been reproduced in at least 22 different books and journals (Maslow, 1971, pp.379–380). Maslow’s 1943 paper mentions cognitive needs such as the desire to know and to understand, and also aesthetics, but does not place them within the hierarchy of five. In other words Maslow recognised, even at this early stage, that his list was incomplete. In spite of this reservation it has been widely reproduced as a complete theory, on the way acquiring its own pictorial representation in the form of a triangle or pyramid, which is reproduced in countless publications. Because the five needs are latently or actively present in all members of the human species, they are described as being ‘biologically rooted’. This is a key theme throughout Maslow’s work. He is dealing with the characteristics of a particular species, some of which may be shared with other species, but nevertheless he avoids extrapolating from one species to another. The higher need is a later phyletic or evolutionary development. We share the need for food with all living things, the need for love with (perhaps) the higher apes, the need for self-actualization with nobody. The higher the need the more specifically human it is. (Maslow, 1954/1987, p.57). Following the 1943 paper Maslow’s work took two distinct directions. One was the practical application of his theories to the workplace. This involved detailed observation of working practices in various organisations with a view to improving motivation, and with this work came international recognition. An example is the journal he kept while at Non-Linear Systems in Del Mar, California in the summer of 1962, which was republished recently as Maslow on Management (1998). The other strand to his work involved a study of those people who could be considered to be self-actualisers: those who have achieved, or are achieving, their full potential as individuals (Maslow, 1962/1968). The obvious question he asked was: If someone is already self-actualising, what then motivates that person? In seeking an answer he came up with motivation by intrinsic values such as ‘truth, goodness, beauty, perfection, excellence, simplicity, elegance, and so on’ (Maslow, 1969, p.4), in other words values that transcend the individual’s personal self-interests and for which he coined the term ‘B-values’. This is in contrast to the other five motivational levels, all of which involve self-interest in some form or other. In turn this led to concepts such as ego-transcendence and peak-experiences (Maslow, 1962/1968, 1964/1970), and eventually to the founding of transpersonal psychology. The fully developed (and very fortunate) human being, working under the best conditions tends to be motivated by values which transcend his self. They are not selfish anymore in the old sense of that term. Beauty is not within one’s skin nor is justice or order. One can hardly class these desires as selfish in the sense that my desire for food might be. My satisfaction with achieving or allowing justice is not within my own skin; it does not lie along my arteries. It is equally outside and inside: therefore, it has transcended the geographical limitations of the self. (Maslow, 1969, p.4). 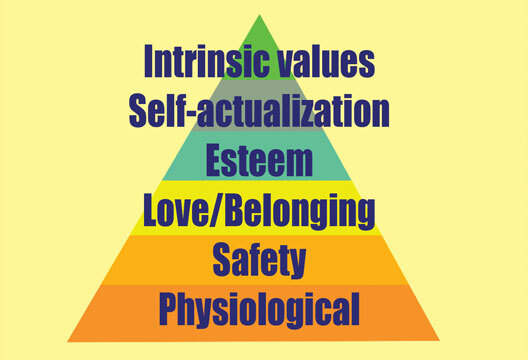 Initially Maslow perceived these motivations as spiritual and therefore did not add them to his hierarchy of biologically rooted motivational needs. We are the products of evolution, and whatever characterises the whole human species must be biological in nature. Only a percentage of human beings are motivated at this level, so he coined the terms ‘metaneeds’ and ‘metamotivation’, as if they were somehow beyond what could be defined as characteristic of the whole of the human species. Thus self-actualisation was still at the top of his hierarchy of universal, biologically rooted, motivating human needs. This meant that when Maslow wrote of self-actualisers, sometimes he meant those who are still pursuing further aspects of self-fulfilment and sometimes he meant those who are pursuing B-values i.e. metamotivated people (Maslow, 1962/1968). He told me that he had just completed writing a paper that was, in his own words, ‘…the culmination of 30 years of work in the field of psychology.’ … Maslow’s manuscript arrived in June 1967. The title, ‘A theory of metamotivation: The biological rooting of the value-life’… was rather long and in conversation we referred to it as the ‘metamotivation paper’. (Sutich, 1976, p.11). The pursuit of what he had called ‘metaneeds’ could now be added to his hierarchy as a sixth level because it satisfied the criterion of being biologically rooted in our species just like the other five needs. Writing in his ‘metamotivation paper’ (these extracts taken from its reprint as chapter 23 in The Farther Reaches of Human Nature: Maslow, 1971), Maslow said that these metaneeds, ‘though having certain special characteristics which differentiate them from basic needs, are yet in the same realm of discourse and of research as, for instance, the need for vitamin C or for calcium’ (p.309). Basic needs and metaneeds were viewed in the same continuum, ‘in the same realm of discourse…they are all biologically desirable, and all foster biological success’ (pp.311–312). Although Maslow felt that intrinsic values are not ‘fully evident or actualized (made real and functionally existing) in most people’, he also wrote that the full definition of the person or of human nature must include them: ‘they are not excluded as potentials in any human being born into the world’ (pp.304–305). ‘The so-called spiritual…life is clearly rooted in the biological nature of the species’ (p.315). These quotes demonstrate that Maslow finally considered the Hierarchy to include the so-called ‘metaneeds’, the need to pursue intrinsic values that transcend self-interest, as a sixth distinct level beyond the need to self-actualise. Yet so much of the literature on the subject overlooks this addition. All five preceding levels involve the individual’s self-interest, including self-actualisation, which is about achieving one’s own full potential. It is at the sixth level that one is motivated by values that can be called ‘ego-transcendent’. The two motivations that Maslow left unassigned in his seminal 1943 paper can also now be placed at level six: the desire to know, and aesthetics, are to do with knowledge and truth, beauty and harmony, all of which are intrinsic values. The metamotivation paper was published in the Journal of Humanistic Psychology. This was a fledgling branch of psychology in the States and had not yet found its way into psychology on this side of the Atlantic, dominated as it was by psychoanalysis and behavioural psychology. It is unlikely to have been read over here by more than a handful of humanistic psychology pioneers. In January 1968 Maslow had his first serious heart attack and he died in June 1970 (Sutich, 1976). He therefore had little chance to consolidate his new perception of the Hierarchy, and he never actually spelled out in print the new list of motivational needs. Values arising from religious beliefs are now addressed within transpersonal psychology, but at that time this embryonic branch of the profession had not yet been defined or even named, for it emerged with the first issue of the Journal of Transpersonal Psychology in 1969. Yet within transpersonal psychology today there does not seem to be an acknowledgement of these ego-transcendent motivations being separate from the ego-centred need to self-actualise. It is a matter for regret that Maslow’s insight concerning the addition of this level has gone almost unnoticed, especially as he described it as ‘the culmination of 30 years of work in the field of psychology’ (Sutich, 1976, p.11). Had he lived longer I feel sure he would have built upon his new integrated theory of motivation embracing the physiological, emotional, social and spiritual aspects of human nature, together with its practical applications to the workplace and to society in general. Maslow, A.H. (1943). A Theory of Human Motivation. Psychological Review, 50, 370–396. Reprinted as chapter 2 in Motivation and personality (3rd edn), 1987. Maslow, A.H. (1967). A theory of metamotivation. Journal of Humanistic Psychology, 7, 93–127. Reprinted as chapter 23 in The farther reaches of human nature, 1971. Maslow, A.H. (1969). The farther reaches of human nature. Journal of Transpersonal Psychology, 1(1), 1–9. Maslow, A.H. (1971). The farther reaches of human nature. New York: Viking Press. Maslow, A.H. (1998). Maslow on management (D.C. Stephens & G. Heil, Eds.). New York: Wiley. Sutich, A. (1976). The emergence of the transpersonal orientation: A personal account. Journal of Transpersonal Psychology 8(1), 5–19.